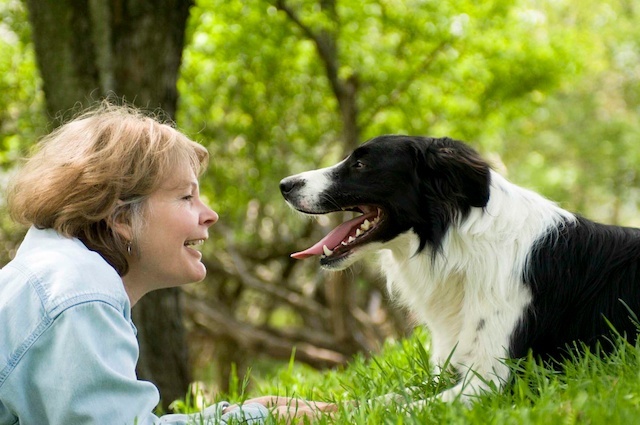 One look is all you need to understand the enduring bond between humans & dogs. Domestic dogs, unlike their wild wolf cousins, are adept at non-nonverbal communication with humans, and a lot of eye contact happens between dogs and their owners. But there’s more to that gaze than meets the eye: When owners and their dogs stare into each other’s eyes, levels of oxytocin - the so called “love” molecule - spike in the bloodstream of both man and dog. The same effect occurs when a mother stares at her baby, and researchers, in a new study, believe this mutual love-fest is an example of coevolution that helped dogs ditch the wilderness to become man’s best friend. If you were to hang out in a wolf pack, you’d be well served avoiding eye contact. In the wild, wolves perceive direct eye contact as an act of aggression. So why, then, does your chubby Labrador gaze longingly back at you? Japanese researchers had a theory: Perhaps dogs use their puppy eyes as a way to tug on your heartstrings, and, well, fall in love. To test this, they performed two experiments to monitor levels of oxytocin in the urine of both dogs and humans after brief interactions. Oxytocin is a hormone that has long been known to foster intimacy, bonding and maternal behaviors. In the first test, researchers tested oxytocin levels in the urine of 30 owners before and after they spent 30 mins in a room with their dog. Their analysis revealed that owners whose dogs stared at them longer in the first five minutes experienced a big boost in oxytocin levels. 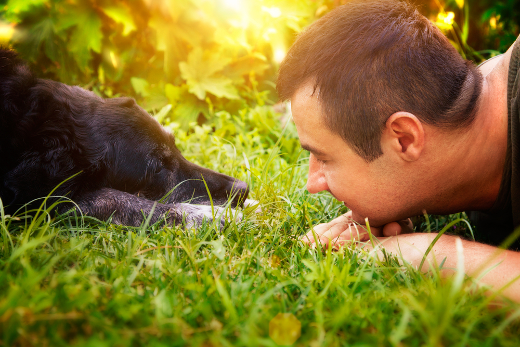 Similarly, dogs that stared at their owners longer also received a boost of the hormone. When the experiment was repeated with wolves, there wasn’t a mutually beneficial oxytocin loop; the wolves were not interested in looking at humans in the room. In the second experiment, researchers dosed dogs with oxytocin by nasal spray, and the dogs spent time in a room with their owner plus two strangers. They found that female dogs gazed at their owners for even longer than before, though male dogs were unaffected, for reasons that remain a mystery. The second experiment, researchers say, may be evidence that a deep gaze is one of the tools dogs use to openly show their affection. The same thing happens when a mother holds a baby in her arms and gives it a loving look. The mutual demonstrations of affection release oxytocin and strengthen the bond between the two. Researchers published their findings this week in the journal Science. It makes sense, evolutionarily speaking, for dogs to have a few tools to nurture a bond with humans. Domestic dogs enjoy the warmth, safety and, of course, table scraps from their human companions. Humans, in turn, enjoy the protection offered by dogs. Researchers believe gazing is a way to communicate social attachment, arising over the millennia of human-dog coevolution. So next time your dog is giving you puppy eyes, it’s probably him saying, “I love you.” Unless of course it’s “I would like a bite of that sandwich please.” Hard telling.